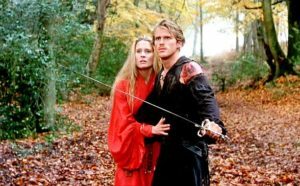 The Princess Bride is a late eighties – early nineties classic adventure film from the time when these kinds of movies were reaching their end point. Sure, more than a decade later, the Lord of the Rings trilogy would bring the genre back, but when The Princess Bride was made, the genre was growing thin. And then this movie comes a long and knocks everybody’s socks off. The movie is smart in the way that it tells a story within a story and gives us a tale of kidnapping and lost love. The characters are all funny on their own, and the story carries our main couple through one challenge after another. The whole thing works. 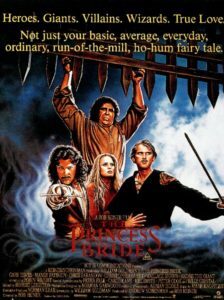 The Princess Bride is an adventure movie where the focus is as much on comedy as it is on anything else. The movie was made in the late eighties, right at the time when movies like this were still going strong, but were nearing their end. The fantasy adventure days of movies like Highlander and Willow were fading. And this movie came in and blew them all away with its casual attitude and fun spirit and energy. It’s a movie that never takes itself seriously and instead goes for the laughs and the simple storytelling. 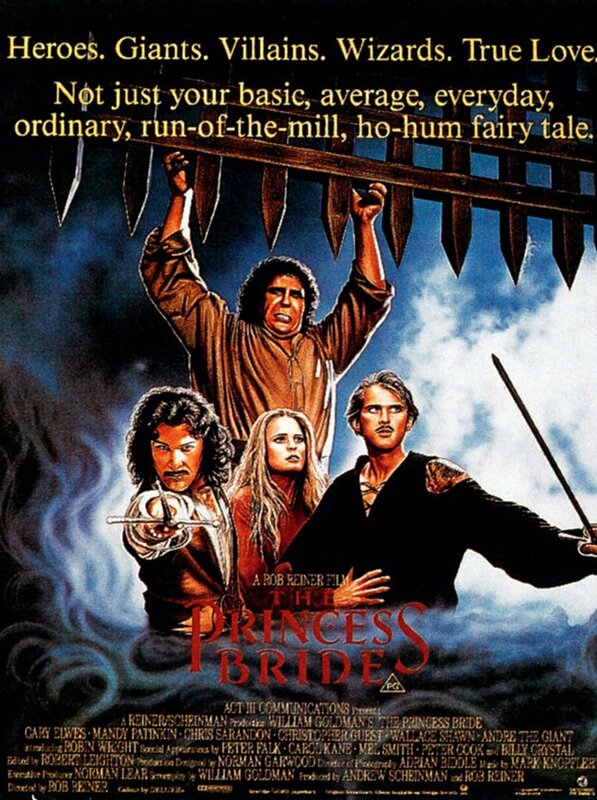 Consider that the main characters are named Princess Buttercup and Prince Humperdink. That’s just a small taste of the level of campiness this movie has going for it. The movie opens with a boy being in bed sick when his grandfather arrives to read him a story. The grandson is played by a young Fred Savage and his grandfather is played by Peter Falk. Just these two actors alone are TV legends, (Savage from The Wonder Years and Falk from Columbo,) and they basically narrate the film. Especially Falk who is reading the story. He’s got a one of a kind terrific voice, and is just perfect for this brief role, convincing his grandson that this is a story worth listing to and watching as his grandson slowly changes his mind about the story during the course of the film. The story here is simply about a young woman named Buttercup (Robin Wright,) who falls in love with Westley, (Cary Elwes,) the stable boy who works on her father’s farm. And Westley falls in love with her as well. The only problem is that Westley is poor and cannot afford to provide for her, and so he leaves to seek his fortune and then one day return. And not long after her has been away, does new spread that Westley has been killed by a pirate who dresses in a black mask, (not unlike Zorro.) Five years later, Buttercup is all set to marry Prince Humperdink, who is not exactly a very nice guy. That’s the setup. We now start following Princess Buttercup on one of her daily horse rides through the woods. It’s pretty unbelievable to think that the Princess would be permitted to go riding on her own, without any bodyguards or protection. But she goes, and is kidnapped by a band of criminals. There are three men in this group, and one is taller than the next, (as pointed out by the scene where we first meet them and the three men stand in a lineup form from tallest to shortest.) The men are Vizzini, (Wallace Shawn,) Inigo Montoya (Mandy Patinkin,) Fezzik (Andre the Giant.) They bring Princess Buttercup aboard their boat and are clearly trying to sail her somewhere when they are attacked. It is the black-masked pirate who attacks them and then pursues them up the side of a mountain. This is where some of the comedy really starts to kick in. Really its the band of criminals who start off the funnies, with the rhyming game that Fezzik and Inigo Montoya play, saying lines like “would anyone care for a peanut,” just because they rhyme. But now, with the Black Masked Pirate, he persuades Inigo Montoya to throw down a rope and help him up the side of the mountain. since Montoya is waiting for him to get up there, and The Pirate claims that it will be much faster if Montoya helps him up. And once he does get up to the top, a sword fight ensues. After the Pirate finishes with this sword fight, it’s onto the next challenge. He next fights Fezzik, the giant, in a hand to hand combat scene, that owes a lot to wrestling. Hanging around Fezzik’s neck, the Pirate ends up tiring him out and then choking him, at least enough to get him to pass out. And from there, the Pirate pursues the princess while she is in the clothes of the team’s leader, Vizzini. The challenge against this man comes in a mind test involving poisoning one cup and then switching them around, over and over against, so that Vizzini will have to choose which one to drink. It’s. fun scene with a pretty entertaining resolution of how The Pirate was able to maintain control of the poison at all times. By now, we are in the third act. The first act was setup, and the second one dealt with these three criminals. It was great to see The Pirate take out each criminal in a different kind of challenge, independent of the others on the team. 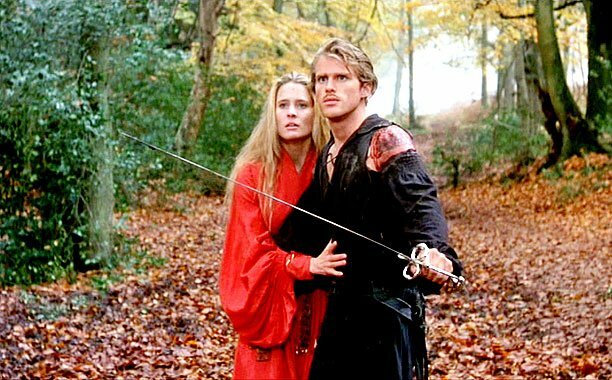 And for the third act, The Pirate, (now revealed to be Westley, although the only one who is surprised by this is Princess Buttercup,) and his love must deal with some challenges of their own, while in the woods. These include both a pit of quicksand and also some giant rat like creatures who attack them. Westley handles both problems and then, just when he is completely exhausted, the Prince and his knights show up. They take Westley away and bring Princess Buttercup back to the castle. Buttercup wants to know what happened to Westley, and is told that her love decided to leave her. Believing this, she agrees to once again go through with marrying Prince Humperdink. Only the truth is that Westley is being held and tortured in the Prince’s dungeon. And luckily he’s got two characters who come to help break him out. The two members of the band of criminals, that he bested earlier in the movie, but seemed to be just following the orders of their leader, now show up to save Westley, and there’s a good reason why. Montoya is in pursuit of the man who killed his father, (as established in one of the earlier scenes, when he explains this story to Westley.) Fezzik finds out that the man he is looking for, (a man with six fingers on one of his hands,) is in the castle. On top of that, Montoya believes that they need Westley’s brains to help them win, considering how badly outnumbered they are. And so the trio goes to visit two very weird looking characters who run a potions and antidotes workshop. These characters are played by Billy Crystal and Carol King in what have got to be the best cameos in the movie. They argue and dispute each other, and also give the men a hard time who come to them seeking a potion that will bring Westley back to life, from the unconscious state he is in when they find him in the dungeon. Crystal and King are pretty funny and fantastic here, and they definitely give the movie a little extra shot of energy, right when it is most needed. And from there, it’s onto the castle to face the Prince and win back Buttercup. But even that is met with its challenges, including the fact that Westley is too weak to fight and that there are about sixty guards outside of the castle walls, and only three of them. But this movie once again uses wits, (just like in the poison scene where Westley faced off against Vizzini,) to help our characters come up with a trick for fooling the guards. This movie has a lot of fun with challenges and little tricks like that. The story is pretty simple, but it keeps moving that whole way through with some fantastic set pieces and obstacles. And the comedy is right there, at the perfect level, where it’s not trying too hard. Like Westley’s whatever happens happens, kind of attitude, the comedy level here knows its funny, and doesn’t have to keep trying to prove it. This story of adventure combined with this level of comedy turns out to be a perfect fit.